Liberal Democrats blocked Tory plans to weaken our human rights obligations in Government and we will continue to fight to stop them in opposition. It would appear that David Cameron is waking up to the fact that this ridiculous policy is easier said than done. Not only will he struggle to cobble together a majority of votes to support it, but he clearly hasn’t thought through the ramifications it will have on the devolution settlement. Europe’s human rights laws were designed by British lawyers to reflect British values of justice, tolerance and decency. The Tories now want to throw all that good work away – we won’t let them. Today was an unveiling of the old nasty Tory party; devoid of fairness and intent on curbing our freedoms. The human rights we hold dear, our right to privacy in an online age and our future as an outward-looking country are all hanging in the balance again because of this Tory Queen’s Speech. A new Wales Bill is a positive step for devolution in Wales, but it’s disappointing that few details were revealed. The Tories must deliver in full on the St David’s Day agreement – no ifs, not buts. I urge the Government not to dither on the new Wales Bill. George Osborne promised it would be delivered within a hundred days and already that appears to be a broken promise. The Liberal Democrats ensured devolution moved faster than it had done in any time over the previous decade – the new UK Tory Government can’t allow that momentum to be lost. Scottish Liberal Democrat Leader Willie Rennie has issued this statement acknowledging the seriousness of Alistair Carmichael’s actions but saying that the Orkney and Shetland MP deserves a second chance. I have discussed the serious nature of the publication of the Scotland Office document with Alistair Carmichael. He fully understands the impact it has had on his reputation. He deeply regrets his actions, has accepted responsibility for his error of judgement, apologised to Nicola Sturgeon and the French Ambassador and declined his ministerial severance payment. I have known Alistair for almost thirty years and have worked closely with him in parliament for almost a decade. I have always been impressed by his energy, dedication and professionalism. 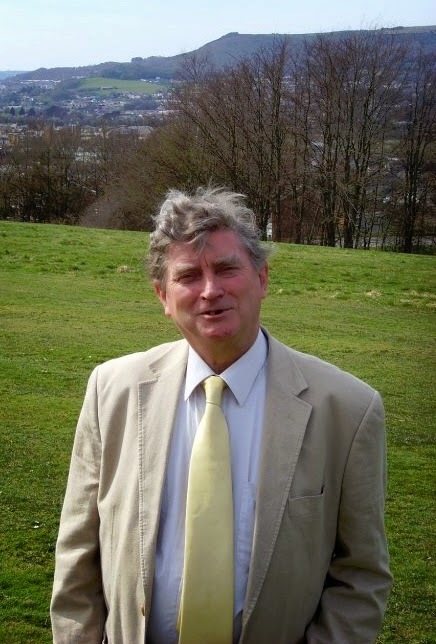 He has served Orkney and Shetland for fourteen years and has been elected on four separate occasions. It is clear to me that recent events are an aberration. As a liberal I believe that people deserve a second chance. I hope fair minded people would agree that Alistair Carmichael should be given that second chance. Yesterday, the Scottish Liberal Democrat Party Executive met and gave Alistair Carmichael its support. He has my support too. Alistair will now get back to his job representing Orkney and Shetland. Following the agreement of the Federal Executive and the party’s returning officer I am pleased to be able to confirm to you the timetable for the election of a new party leader. Any member who joins the party before the close of nominations is able to vote in the election, so this is a fantastic time to ask local supporters and former members to join the party. The easiest way for them to join is online at www.libdems.org.uk/join. If you have any questions regarding this process, please get in touch via www.libdems.org.uk/contact. 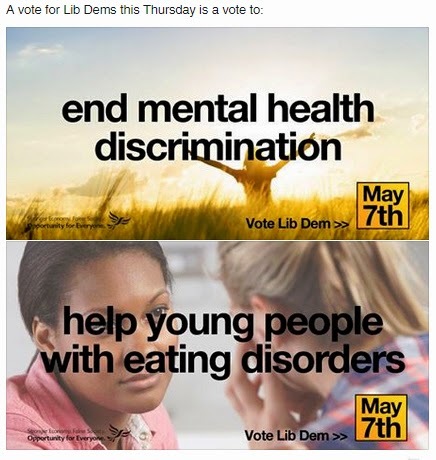 People have responded to the shock Tory victory by flocking to the Liberal Democrats. They are still joining the party every few minutes. Since close of polls on Thursday up to 6pm yesterday over 4,000 new members have joined the party. Join the fight-back by clicking on www.libdems.org.uk/join, or phone Huw Evans on 01792 852735/07856 549753. In addition to helping us add to Kirsty William's great team in the Senedd in next year's Welsh general election, anyone who joins now will be able to vote in the election for the new leader of the Federal (UK) Liberal Democrats to replace Nick Clegg. Logically, the proposition is unanswerable. Liberal Democrats have cooperated in a government which has not only restored international credibility to the United Kingdom but also started the readjustment of the economy so that it is no longer totally dependent on the caprices of the money market. We have restored civil liberties. The sackings of the years following the credit failure of 2008 have been more than reversed, more jobs being created in the private sector than the public. We have lifted the tax threshold of millions of people while still narrowing the gap between government expenditure and income. People have suffered in that time (let us avoid the mealy-mouthed "tough decisions had to be made") but we are now in a position to restore fairness to both benefits and public service pay without increasing the deficit again. We can rebut our opponents' recurring gibe, that our promises are unrealistic because we have no recent experience of government. 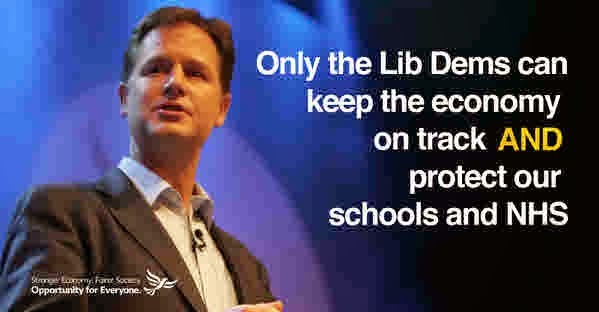 Not only have we had ministers in the Treasury, with access to "the books", but virtually all the constructive achievements of the coalition - on pensions, apprenticeships, investment in the railways, the Green Investment Bank, stopping the post office closure programme - are down to Liberal Democrat ministers. (There were many more things which we persuaded the government to accept. 32 of them are listed here.) All our manifestos in the past have been rigorously costed, but at last we are able to provide supporting evidence for that fact. But emotion and traditional loyalties play a large part in voters' decisions. There is no doubt that in certain quarters merely discussing common problems with Conservatives is equivalent to supping with the devil. To actually go into government with Conservatives clearly alienated many, including some within our own party. It is clearly going to colour opinion. People forget the situation in 2010, though. Greece, Portugal, Spain and (most worryingly as an economy similar to our own) Italy were at varying levels of financial meltdown. Their government bonds all at times approached or achieved "junk" status. There were riots and unstable governments. So there was a need to show that there would be stable government for the term of a parliament, even though the constituent parts of that government were traditional enemies. For the alternative, see what has happened to France in that time. Domestically, Labour had indulged in a number of expensive schemes of doubtful benefit or hope of successful completion. There were the PFI schemes which continue to burden the English NHS and which would have (until the coalition caught most of them) formed the backbone of the Building Schools for the Future programme as Labour belatedly addressed the backlog of school replacement in England. There was the over-ambitious NHS IT scheme. There was the massive centralised identity database which was officially estimated at £5.6bn but which unofficial estimates put at between £12bn and £18bn. That was not only badly designed but would also have set civil liberties back over sixty years. It was a Liberal then who prodded a Conservative government into the overdue abolition of the wartime identity card scheme. It was a coalition of libertarians in the Conservative ranks with Liberal Democrats who laid to rest Labour's ID cards in 2010. We also ended the imprisonment of innocent children, arbitrary stop and search powers and the ability of the police to arrest anyone taking photographs near a public building. Sadly, Conservative ministers have regressed since the early days of the coalition and Liberal Democrats have worked hard to resist such intrusions as the Communication Data Bill. Contrary to Labour claims, the rich are paying more in percentage terms than the poor under the coalition, but of course the rich hardly feel it because their disposable income is continuing to grow. I would be more sensitive to gibes from Labour about "tax cuts for millionaires" if Gordon Brown hadn't maintained the Thatcher/Lawson top rate of tax of 40p for all but a few days of Labour's administration; if when Alistair Darling took over the chancellorship he hadn't signalled that his 50p rate was only temporary; if having announced the 50p rate he delayed implementing it for a year, giving tax lawyers plenty of time to put avoidance schemes in place; and if, when in opposition, they hadn't sacked the chancellor who at long last brought some sanity back to government spending and replaced him with the team that had given Gordon Brown such bad advice in the first place. Incidentally, that 2009/10 tax holiday, coupled with a temporary dip in world fuel prices, may well have produced the spurt in economic activity which briefly increased GDP and gave Labour spurious evidence for their claim that they had got the economy on the mend "without the need for austerity". The last part ignores the fact that the cuts in the coalition's first budget were inherited from Darling. (Admittedly, Osborne increased VAT by more than Darling's proposal: to 20% as against 19%.) We also fought to ease austerity where we could. So to protect our civil rights from both Labour and the increasingly vocal authoritarians in the Conservative Party, Liberal Democrats need to be there in force in the next parliament. We also need to be there to maintain sensible economic policies, paying for fairness in the benefits system not by increased borrowing but by fair taxation of the rich and by tackling the tax loopholes that both Labour and the Conservatives have avoided closing. 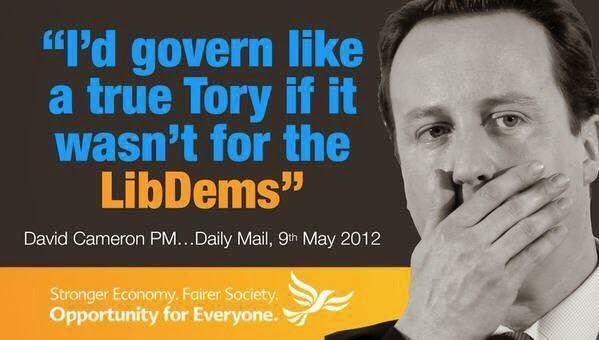 Nearly two years ago, Liberal Democrats chose to do the right thing in the national interest at a time of crisis. We put tribalism aside and the good of the country first. We didn’t come into politics to make cuts, but with the economy on the verge of collapse we knew we had to take the difficult decisions necessary to get the deficit under control and the country back on track. And how did the Labour Party react? They attacked us viciously. They refused to apologise or take responsibility for the mess they created. They opposed every cut and they indulged in cynical scaremongering. In Sheffield, David Blunkett warned of ‘post-Soviet’ meltdown with people fending for themselves. It was the politics of fear and it was a disgrace. 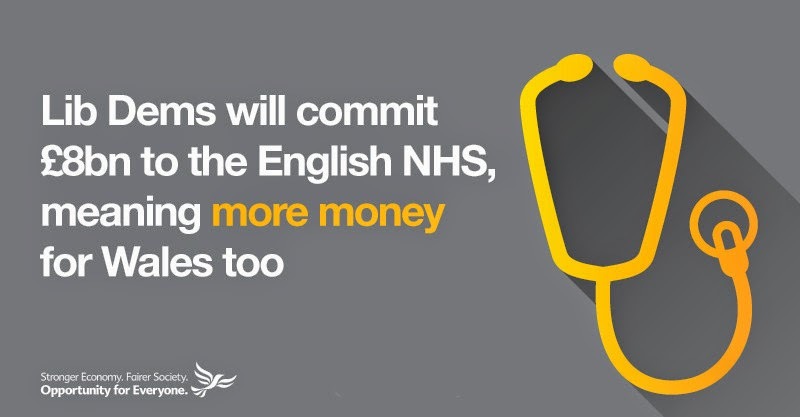 But now, after nearly two years of opposing every cut, Ed Miliband and Ed Balls say they won’t reverse a single one. Yet they still say they oppose them. They have gone from being in the wrong place to being all over the place. From denial to disarray. Many of our excellent councillors and members of the Scottish and Welsh Assemblies lost their seats last May  because of the vicious attacks of their Labour opponents. They must not get away with it again. And from this April, the Youth Contract, an ambitious £1bn programme to make sure every 18 to 24-year-old has the opportunity to earn or learn. You can see Nick's interview by Andrew Marr here. 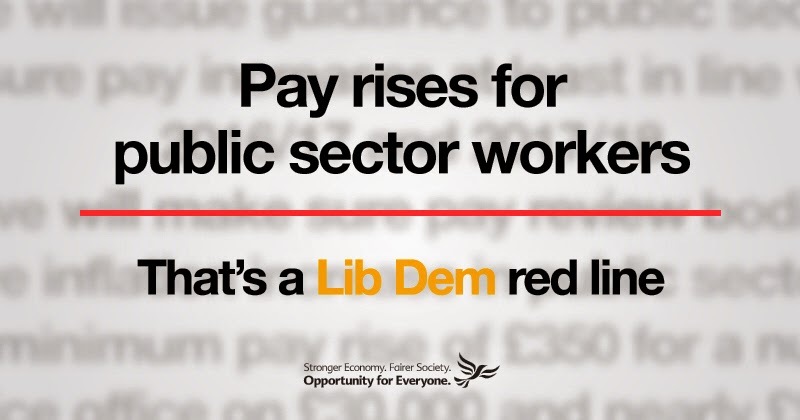 The Liberal Democrats will make pay increases for public sector workers a priority in any coalition talks. After five years of pay restraint, teachers, nurses, police officers and all those who work in the public sector should no longer face pay cuts and will be offered light at the end of the tunnel. The contribution of our public sector workers is the cornerstone of a fair and decent society. Public sector workers have played an important role in helping get the economy on track and Liberal Democrats want to give them the pay guarantee they need. We would introduce a minimum pay increase in line with inflation for the next two years, and guarantee real terms increases in pay once the books have been balanced. This means a nurse on £25,000 would receive a minimum pay increase of £350, a police officer on £30,000 would receive £490 and a teacher on £35,000 would get at least £490 over the first two years. “Liberal Democrats will not enter a coalition with a party not prepared to back pay rises for people working in the public sector. “They have paid more than their fair share, and now enough is enough. “The work they do is the cornerstone of a fair and decent society. We have a moral obligation to support them, and protect the services they provide. “Jobs and pay are under threat from the Conservatives. They want to embark on a slash and burn approach to the public sector. And Labour’s failure to deal with the economy, allowing austerity to drag on, will prolong pay restraint for many years to come. The Liberal Democrats have produced a series of 20 videos giving snippets of our manifesto in BSL. We are the first major party to do so. The full list is here. The country would benefit from the countervailing force of Lib Dem moderation at Westminster. In seats where the Lib Dems are the incumbent or the main challenger, we would vote tactically for them. The paper was far from complimentary about the Tories’ divisive strategy. Five years ago, the prospect of coalition government attracted dire predictions of instability in markets and gridlock at Westminster. Neither proved true. The Conservative-Liberal Democrat coalition has shown European-style cohabitation can work. Curiously, Mr Cameron has not trumpeted its successes. He has preferred to wage a campaign of fear. Labour, he argues, would prove untrustworthy on the economy; and a Labour government would be held hostage by a separatist Scottish National party. The risk of a cross-border leftist alliance is not negligible; but even some Tories worry that its invocation encourages English nationalism. The FT essentially wants to see a continuation of the current economic strategy which is far from being a Tory-only creation. For different reasons it often suits both Conservative and Labour voices to paint a picture in primary colours of undeviating adherence to Plan A. But this caricature is wrong. The reality is more nuanced and rather more Liberal Democrat. The Coalition has shown commendable flexibility, for example in reversing some of the capital spending cuts that were inherited from Labour once it became clear they were holding back the recovery. The Coalition has balanced cuts with carefully targeted stimulus. And above all it has been willing to forego substantial amounts of tax revenue and even slow the pace of austerity in order to help create jobs and encourage people to take them up. This approach has worked. 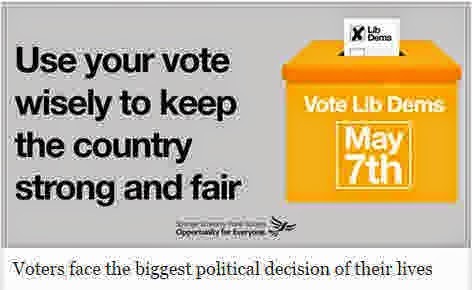 Liberal Democrat policies and influence have been at the heart of it. Three of the five key politicians deciding economic strategy in this Parliament have been Liberal Democrats. Liberal Democrats should be proud of this. It should be front and centre of our election campaign.